Inspired by the matriarchs of director Kent Jones’s youth in Western Massachusetts, specifically his great-aunts, Diane asks what it means to build your life around other people, and what happens when those people begin to slowly disappear. 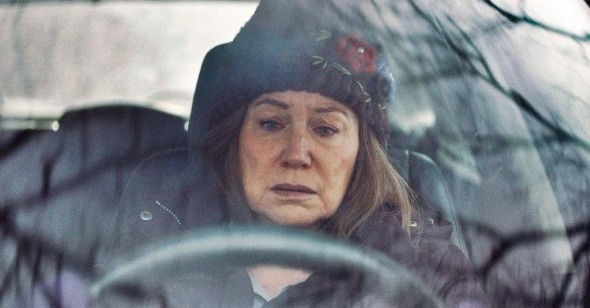 Diane—played with a heartbreaking mix of rage and fragility by Mary Kay Place—drives along winding country roads and thruways to visit others in need: a cousin dying of cervical cancer, a family friend recovering from a hip injury, the guests at her local soup kitchen. She ping-pongs from place to place, Saint Diane, as POV driving shots give us an idea of the monotony of her back-road journey. These drives, which connect the dots between items on her to-do list, are the only real threads tying the film together. Much like the daily lists of tasks we all write, in Diane there’s a sense that the order we impose on our lives is arbitrary, and entirely of our own making. It’s when she visits her close-knit family circle that Diane seems to truly enjoy herself, letting go enough to lovingly poke fun at them, and at herself. A warmly lit kitchen bustles with seniors staunchly committed to airing their every issue aloud amid bottles of High Life and cigarette smoke, and Diane is given a break from her bland world of hospital rooms and the emptiness of her own home. But when she’s with her son, her anger seeps out. He, too, is an item on her list. “Clean laundry to B.” That’s Brian (Jake Lacey), who’s been in and out of rehab for about a decade. Lacey perfectly typifies the recalcitrance of a 13-year-old boy in the body of an adult man: angsty, impatient, unreliable. He shoos her off with perhaps the most aggressive air kiss ever blown, urging her to trust him that he’s not using drugs, despite a host of signs to the contrary. Her family urges her to let go, for her own sake. “Every time you go over there you come back hurt, and bullied, and beat to a pulp,” cousin Donna (Deirdre O’Connell) tells her from her hospital bed. “It’s like telling me to leave a baby on top of a mountaintop to freeze to death,” Diane responds. The more we learn about Diane, the clearer it becomes that she feels immense responsibility for everything and everyone, whether or not they’re within her control. This is Jones’s first narrative feature, and it’s a very personal one. Like Diane’s ancestors, Jones’s family lived in a log cabin on the Canadian border during the Depression. It’s clear the director is more interested in capturing familiar feelings and idiosyncrasies than telling a traditional story—from the bleakness of New England in the winter, to the sense of mounting helplessness in the face of death. Jones has long been a venerable critic and programmer, and the director of the New York Film Festival since 2013. Growing up, Jones said, “Getting interested in movies attuned me to the behavior around me, and being attuned to the behavior around me attuned me to movies.” His last film, the documentary Hitchcock/Truffaut (2015), examines the admiration that the French director-critics of Cahiers du cinéma had for Hitchcock, and how it helped elevate the director’s work to the status it enjoys today. With Diane, Jones follows a similar path as filmmakers like Truffaut and Olivier Assayas, studying the world around him using the tools of filmmaking after doing it for many years through criticism. Jones has said that he couldn’t have made Diane until his mother died, and Mary Kay Place indeed embodies the role of the archetypal matriarch, taking on the troubles of the world. (Jones wanted Place for the part largely because he admired her as the mother of a boy who dies from cancer in Francis Ford Coppola’s 1997 film The Rainmaker.) Drifting from one obligation to another, Diane seems to use other people’s problems to avoid dealing with a nagging guilt that becomes more palpable as the film wears on, and as her loved ones fade out of the picture. Guilt looms large for Diane—even as she throws herself into endless acts of charity. When the French-Canadians settled in New England, they brought their complaints, their casserole dishes and their Catholicism along with them. While Diane’s family and close acquaintances have clearly distanced themselves from the church, they are unable to shake off the guilt and original sin they’ve grown up with. We ultimately learn that Diane’s guilt is multilayered—she still feels responsible for a “sin” she committed 20 years ago, one that strained her relationship with Donna and, she believes, impacted Brian as a child. While Diane generally maintains a stoic exterior, her anxieties reveal themselves abruptly, showing just how hard she’s working to keep it all together. When she blows up at another volunteer at the soup kitchen, Diane is comforted by her best friend Bobbie (formidable fixture of stage and screen Andrea Martin), who time and again is able to tenderly ease Diane’s growing stress with a mix of sympathy and humor. “What would I do without you?” Diane responds. Here, a normally rhetorical question takes on a morbid undertone. After all, the two regularly get together over salads at the Country Buffet to discuss who among their friend group has died. Diane is a claustrophobic film—not spatially, but mentally. If Diane had a mantra, it might be “What’s wrong?”—the first line she speaks in the film, as Donna wakes her from a nap she’s slipped into during visiting hours. Or perhaps the word “shame,” whispered to herself as she travels from errand to errand. In scene that’s at once gratifying and hard to watch, Diane pays a visit to a local bar, breaking from her usual routine, and momentarily silencing the chorus of voices in her head. Knocking back multiple margaritas and dancing by the jukebox to Leon Russell’s “Out in the Woods,” Diane tosses hints that she wasn’t always so saintly. As she moves stiffly but soulfully to the music, it’s as if she’s been inhabited by a former self, one who was a regular at this bar, and who freely indulged in life’s pleasures. This is the closest we come to the usual formula of a film about a middle-aged woman revisiting her youth—but Jones isn’t interested in detailing how Diane gets her groove back. She doesn’t meet a charming stranger at the bar or go home to comically experience hot flashes. When Diane leaves the bar she’s confronted with a reality that’s far more raw, and far less consoling, than we’re used to seeing on screen. As the film moves toward its surreal conclusion and those around her either pass away or cease to need her help, Diane is relieved of her responsibilities. With the prospect of nowhere to drive, no one to serve, and a blank to-do list, she starts journaling and writing poetry in earnest. It’s a practice reminiscent of Reverend Ernst Toller’s ritual diary entries in Paul Schrader’s First Reformed. That film reminds us that keeping a diary is a form of prayer, and doubtlessly Diane is looking for an outlet for her increasingly muddled inner monologue. She describes her guilt as her “shadow” and her “closest companion,” who keeps whispering “don’t forget me.” Jones experiments here with a heady dream sequence, drastically breaking from the film’s rhythm and flooding Diane’s mind with ideas surrounding death, drugs, and repressed memories. (The Argentinian director Matias Piñeiro has a cameo as the enigmatic ferryman guiding her through this underworld.) This unexpected turn suggests Diane is wavering between guilt and nostalgia over her past transgression. Does Diane crave forgiveness for what she’s done, or does she regret leaving it in the past? It may be that the guilt that’s grounded her all these years has also been what’s keeping her company.